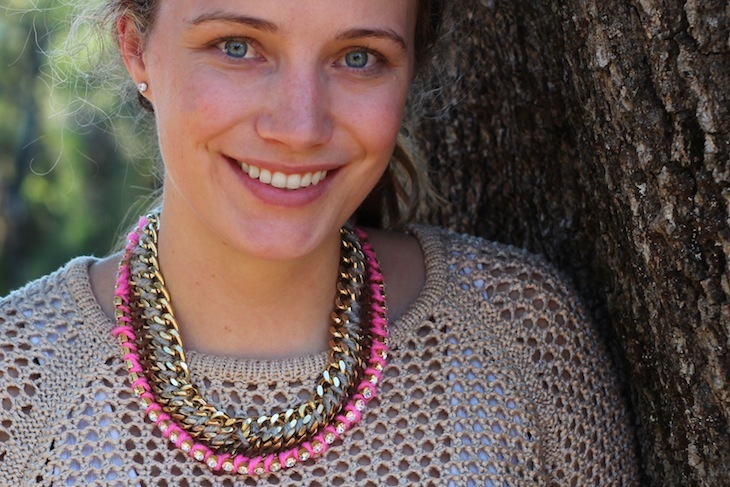 Summer isn’t complete without a bright, punchy necklace. I’ve been inspired by all of the bright necklaces in stores this summer (this and this being at the top of my wish list,) and wanted to make something that I can wear while I’m at home all week on the Cape (or all summer long, for that matter.) Preppy, fun and bright… what could be better? I also made a red, white, and blue version to wear on the fourth, so be sure to scroll all the way down to see how that one turned out. 1. Begin by cutting your cord into six pieces by 60″ each. (three pieces of each color.) // 2. Take your first color, fold it in half, and tie a knot. Your loop should be big enough to accomodate a knot (the knot + loop will account for your clasp.) // 3. Thread your second color through the loop. // 4. 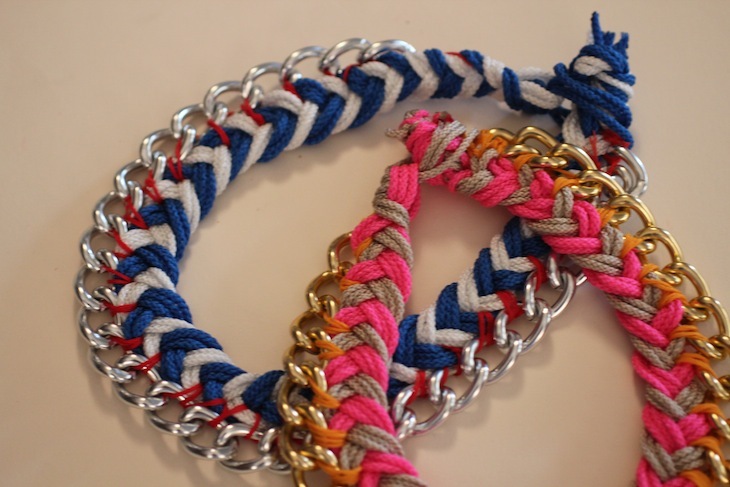 Criss cross your second color over the first color, using the fishtail braid technique that you learned from this post. 5. Continuing the fishtail technique, cross your original first color over the second color. // 6. Continue this technique until you get to the end. // 7. 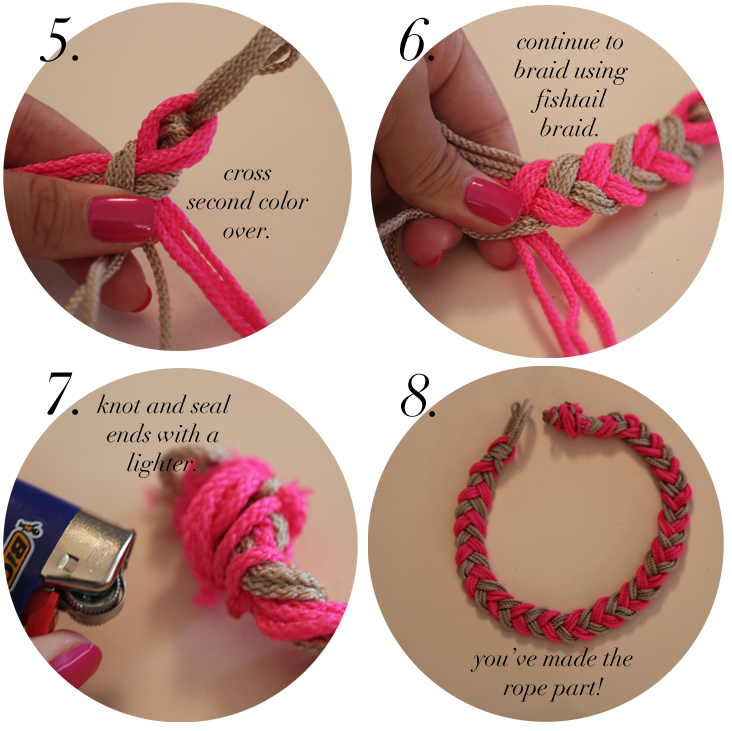 When you get to the end, tie a big knot, and seal the ends together with a lighter. // 8. You’ve made the rope part of the necklace. Technically, you could just leave it alone and be done… but we’re going to snazz it up a bit with some chain. 9. 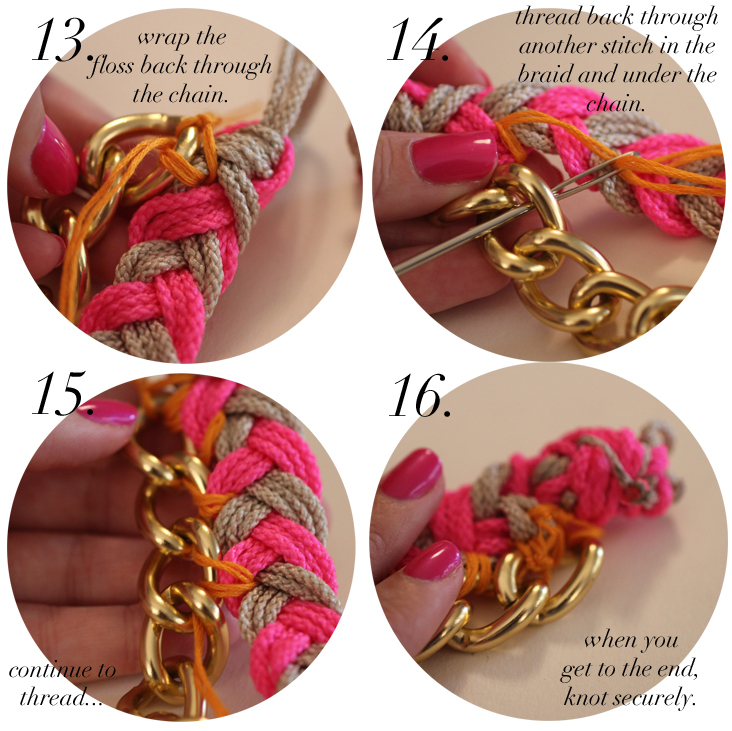 Lay the chain out next to your braided rope necklace, to determine how much chain you need. // 10. Thread your floss through your needle. //11. Tightly tie the floss to your chain. // 12. Thread your floss under the first link of the braid. 13. Wrap the floss back through the chain, and repeat. Each chain link should be looped through twice. // 14. After you’ve wrapped your floss through the first link twice, thread it under the second link and repeat the process. // 15. 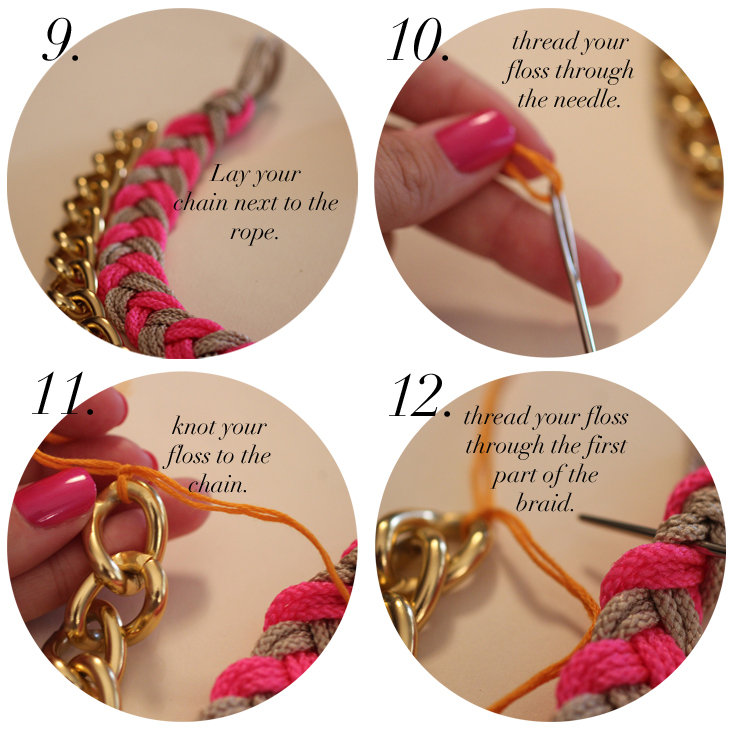 Continue this process for the remainder of the necklace. // 16. When you reach the end, knot securely! You are done! Great, beautiful necklace. I like neon colors.Kisses. Thanks – so happy you liked it! Thanks! I actually linked to that post this weekend! Your creativity when it comes to this blows me away, seriously! Love these. Aw, thanks Liz! I’m so glad you liked it. Loooove this. And the patriotic one is so perfect! So stylish and cool! Loving your blog too, thanks so much for dropping by ours. 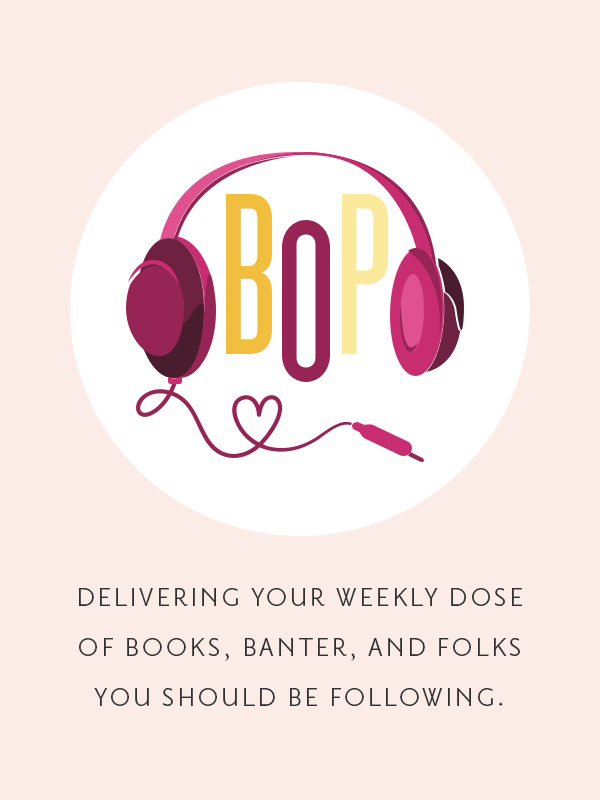 Following you on BL now and looking forward to keeping up! So obsessed!! And love the ring, too! Thanks, Julia!! I hope you try making one! Thank you Danica! I hope you try it!! Thanks Elizabeth, I hope you give the project a try! Beautiful Grace! I love it! This is amazing! Your photos are great and make it look so easy to make too. Thank you so much, Jaclyn! I hope you give it a try. Happy fourth!! You are too kind! xoxo Happy Fourth, Nicole! Thanks, Steph! I hope you make it! omg grace! the red white and blue is soooo fabulous! i wish i could make one in time for celebrations tomorrow! Thanks, Jordan! I think you should make it!! These are so beautiful! I love the neon pink. Love this!! The blue and white one is perf for tomorrow!! That is seriously genius. I love how pretty and versatile it is and that you can change out the colors so easily! Great idea! 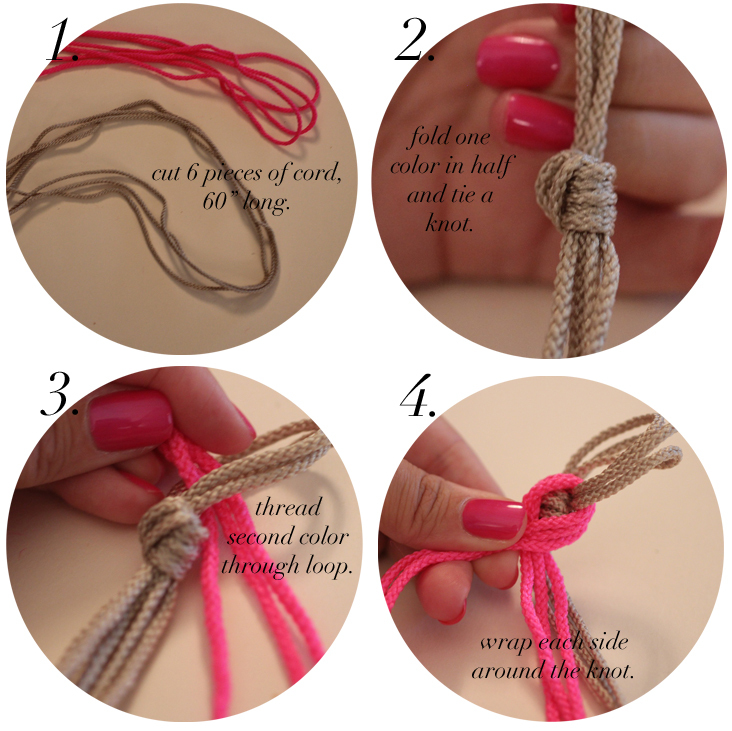 I went to get my supplies to make this and I can’t find macramé cord anywhere! So bummed. Any alternatives you suggest? Hi Danielle! 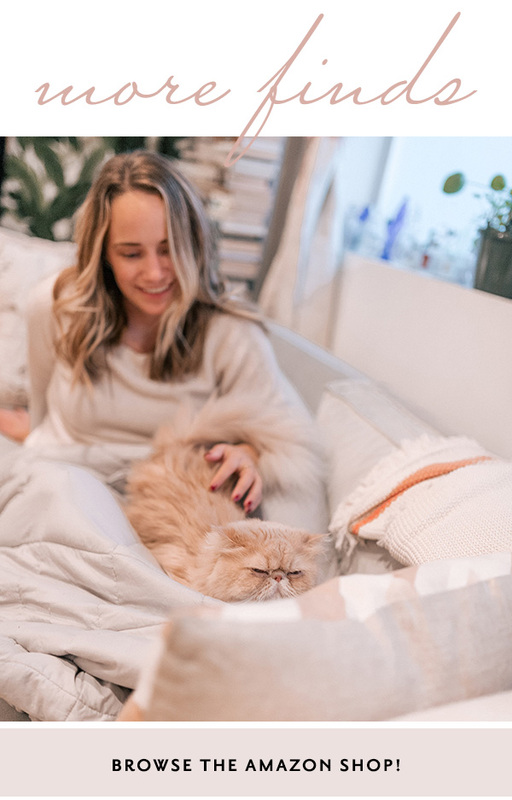 Did you click the link in my post? I linked to Hobby Lobby, who sells (online) the exact cord that I used for this project! Where did you find that chain? Do you know where I could find one like it? Thanks! Hi Lauren, I link to the exact chain I used in the post! It’s from M&J Trimming. So cute! I love the different colors in the braid. Thank you so much! It’s CND Shellac… Tutti Frutti! How do you wear it though? Like how do I fasten the necklace around my neck? The knot goes through the loop! 🙂 hope that makes sense! Hi Ruby, The length of the chain should be whatever length you’d like your necklace to be! I made mine 17″ long. Hope that helps you! thank you for your quick anwers! =D sure helps me a lot,, gonna shop for it today hope i’ll find everything! Of course! Just let me know if you need any more help. Good luck!! I hardly ever (make that practically NEVER) comment on anyone’s blog, but this is such a GORGEOUS piece of work that I felt compelled to let you know. When I saw it I was like “WHERE DO I BUY IT?”, and then-TO BOOT-you show us how to make it! love love this one too!! where do you get the inspiration?! and also: do you order supplies online? or do you buy somewhere in NY? I can never find ANYTHING i need! Aw, thanks Tara! I don’t know I just do it, haha! I buy most of my supplies online (and always link to where to buy in the post.) All the stuff from this post is pretty easy to find online – I hope you try making it!! I absolutely love this tutorial! 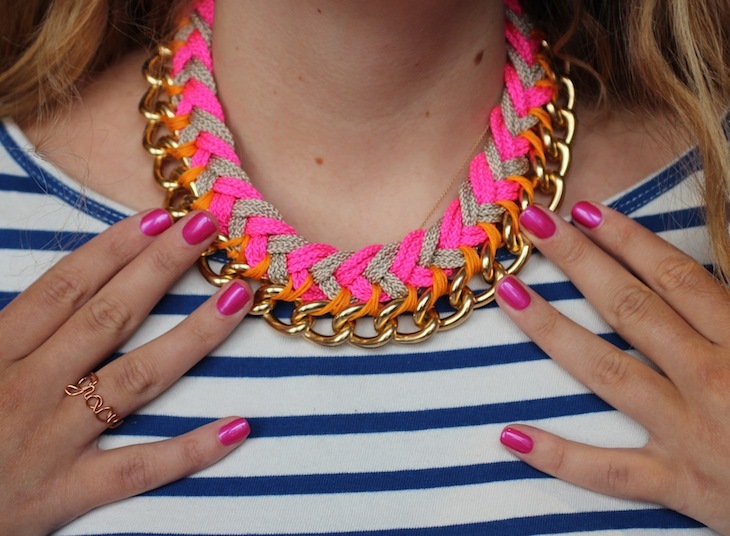 Fabulous necklace, and perfect with your pretty nails, ring and shirt. Thank you Karissa, I’m so happy that you like the project! Where do you buy chunky chain links? Been looking online and they’re just the small ones. Thanks!! Thanks! I actually link to the EXACT chain that I used for the project! Check out the Materials section under the second photo. It’s from M&J Trimming. It’s 17mm wide which guarantees that chunky awesomeness. I made this today, but my rope is too small to be worn around my neck. 60″ of cord folded in half resulted in 14″ of braided rope. I guess I’ll have to undo it 🙁 I love the look though! Oh no, that’s so weird! I’m sorry it didn’t work out for you! Aw, thank you Jen! So happy you like it! I made this over the weekend and absolutely love it! I had a lot of trouble with the fishtail braid, so I had to improvise but it still turned out great. Thank you so much for the tutorial!